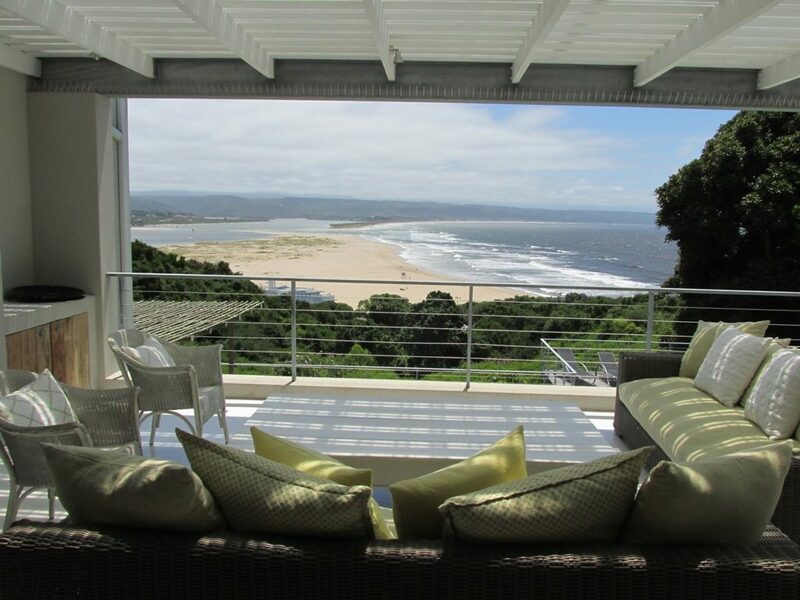 M’Pelisweni “the place of rest”. 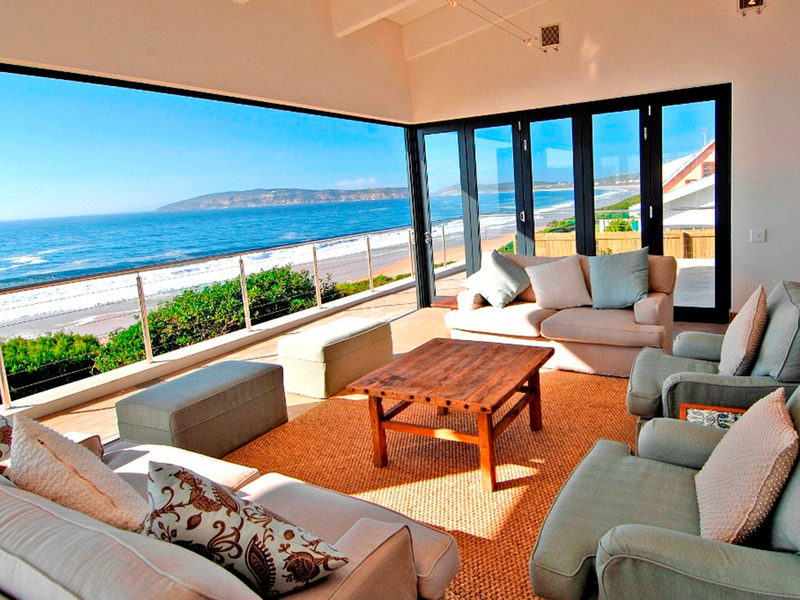 Enjoy the stunning sea, beach and surf views from this beachfront holiday home. 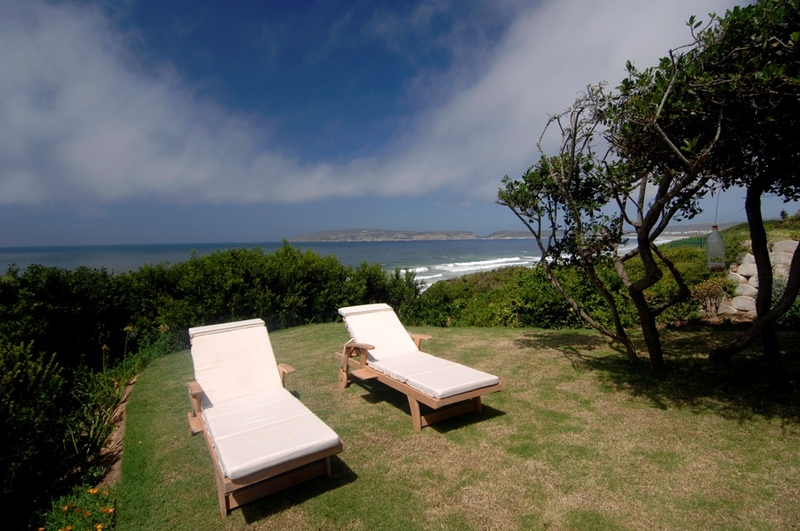 Walk onto Robberg Beach from your own private beach gate. FREE WiFi & Premium DSTV. Secure parking. 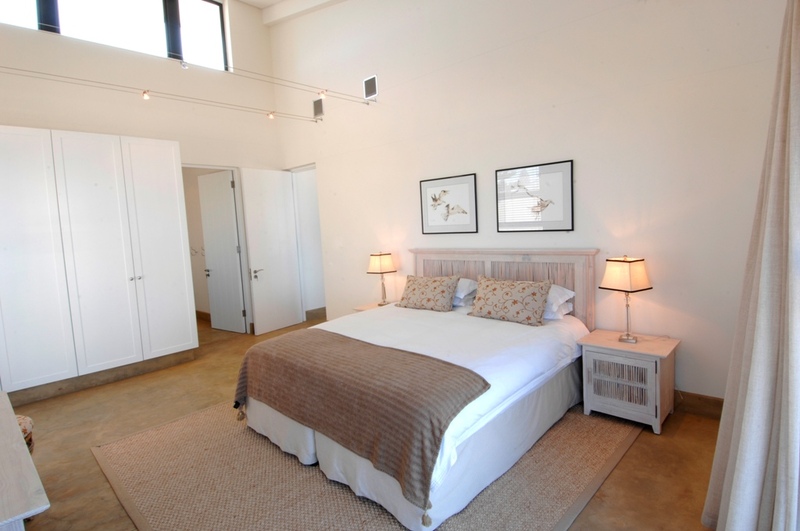 Spacious enough for two families to share – with two main bedrooms, the house sleeps 12 guests. A few minutes to restaurants and supermarket. 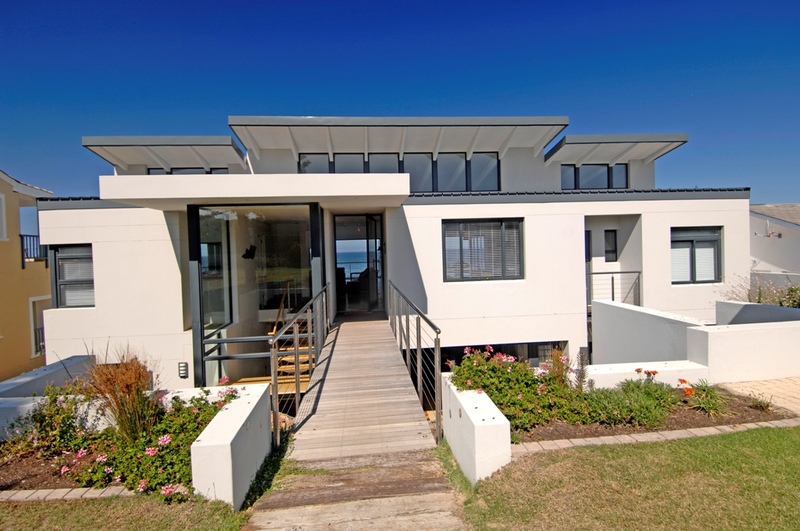 Modern & well equipped self-catering holiday beach house offering spectacular views and spacious accommodation – you may never want to leave. Entrance is via a timber bridge into the 1’st floor of the house which offers 180° of view of the bay and mountains. 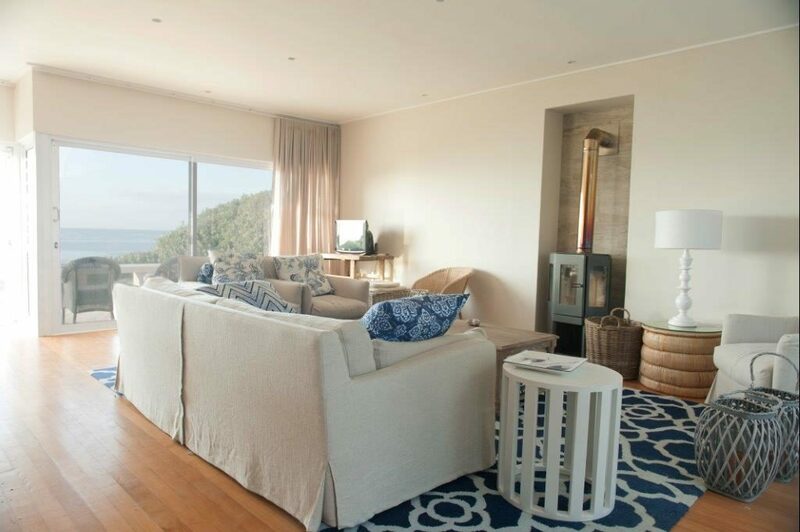 Spacious & light, the open-plan living area with dining rooms (seating 12) has large glass doors leading onto the sea facing balcony. 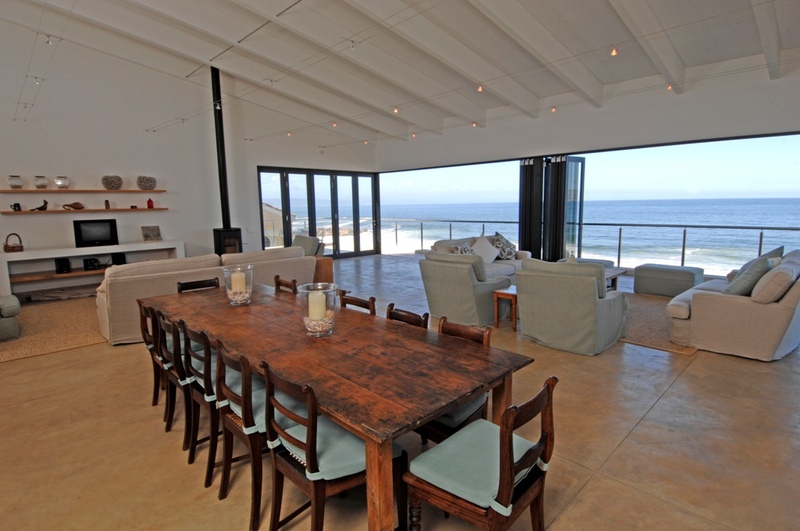 This has a weber braai and wrought iron table seating 5 & 4 sun loungers with cushions. 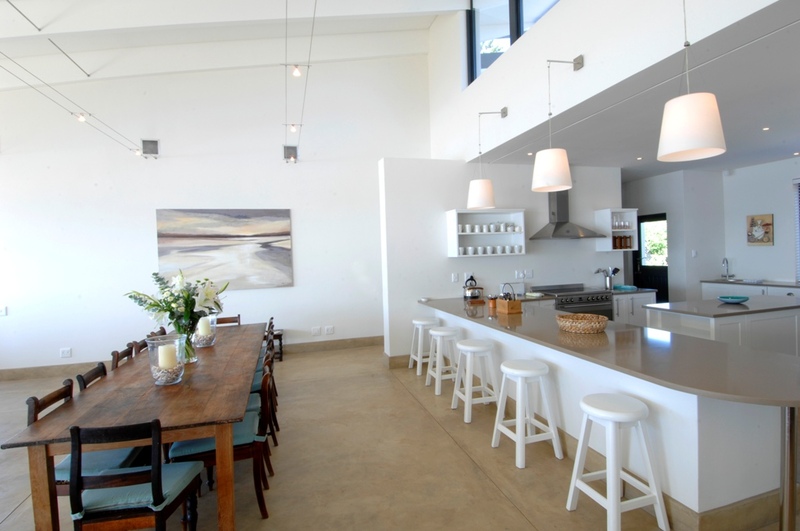 The kitchen is modern and well equipped with separate scullery. 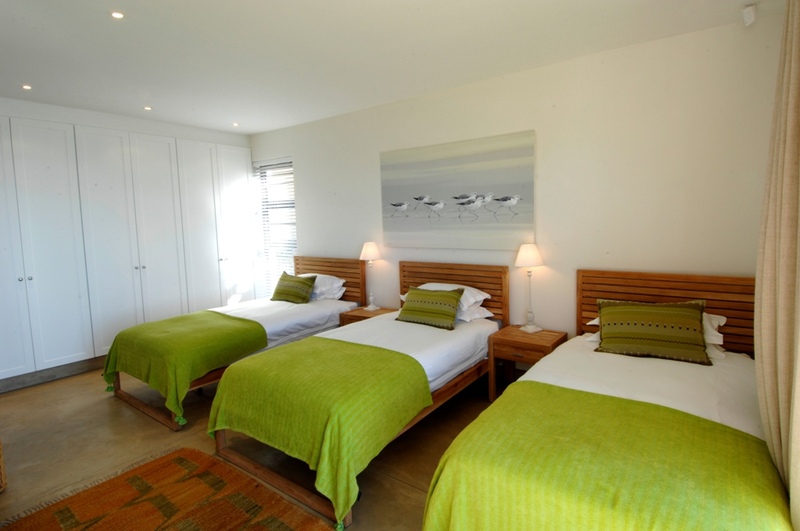 The two main bedrooms are upstairs as well as the guest toilet. 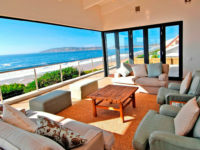 TV lounge has: TV and PVR DSTV, HIFI, DVD & CD player and IPOD/MP3 docking station. 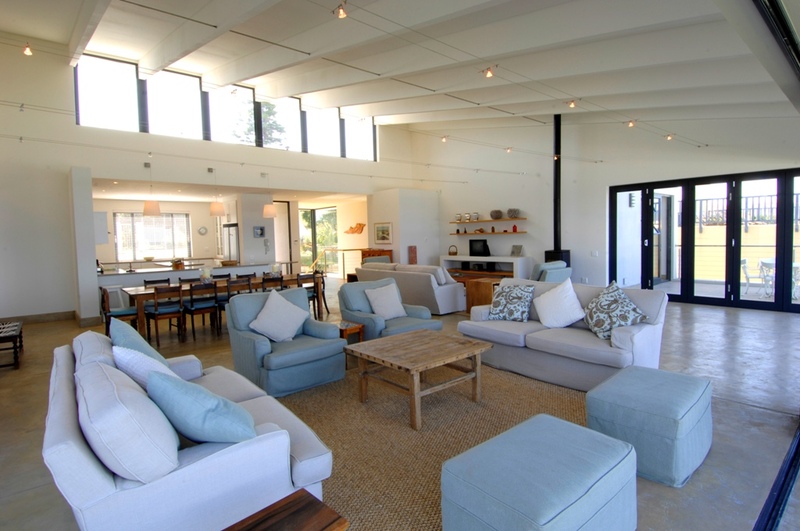 For cooler months – there is under floor heating in the living area as well as a wood burning Morso fireplace in the lounge. 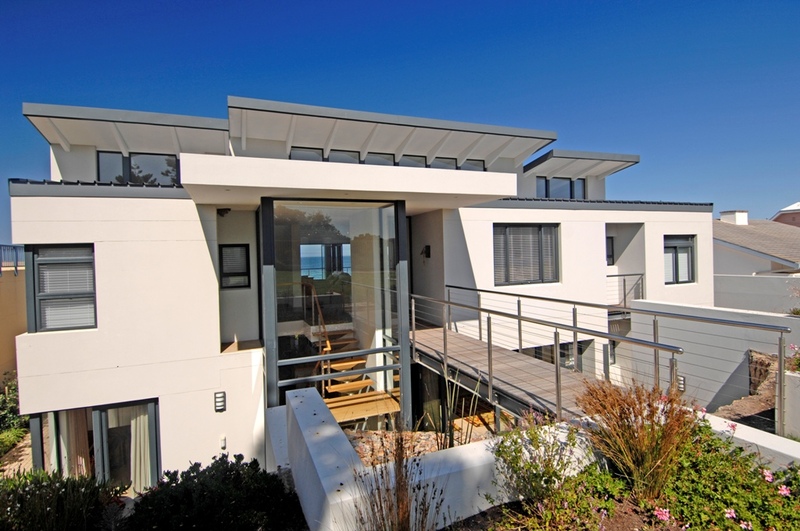 Access the downstairs area via a large glass enclosed staircase to the remaining bedrooms, large open-plan TV lounge, bar, reading lounge and large glass doors leading onto the sea facing covered patio and small garden area. There is a private path leading directly from the garden to the beach. The TV lounge has: TV, PVR DSTV. There’s another guest toilet downstairs as well as a laundry equipped with a washing machine & tumble drier. 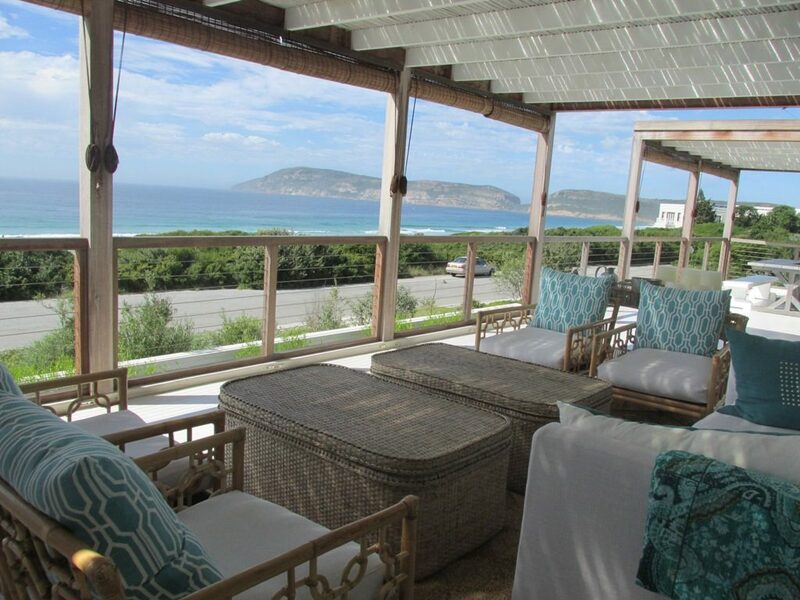 The patio is equipped with a large wooden table seating 10, two teak sun loungers & portable braai. Bedroom 1: King sized bed with full en-suite bathroom: Shower, Bath & Toilet. Sea Views and door to balcony. 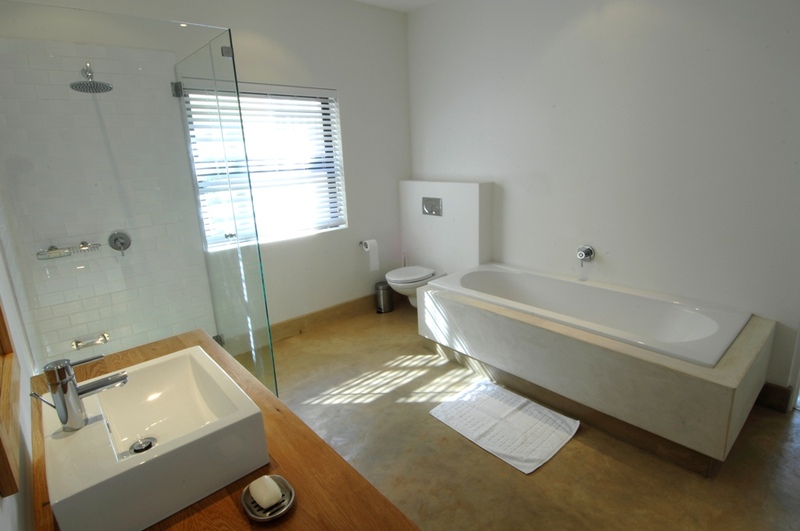 Bedroom 2: King sized bed with full en-suite bathroom: Shower, Bath & Toilet. Sea Views and door to balcony. Bedroom 3: X3 Single Beds with views and door to patio. Bedroom 4: X2 Single Beds with a door leading to the garden. Bedroom 5: X3 Single beds with views and door leading to the patio en-suite bathroom: Shower, bath and toilet. 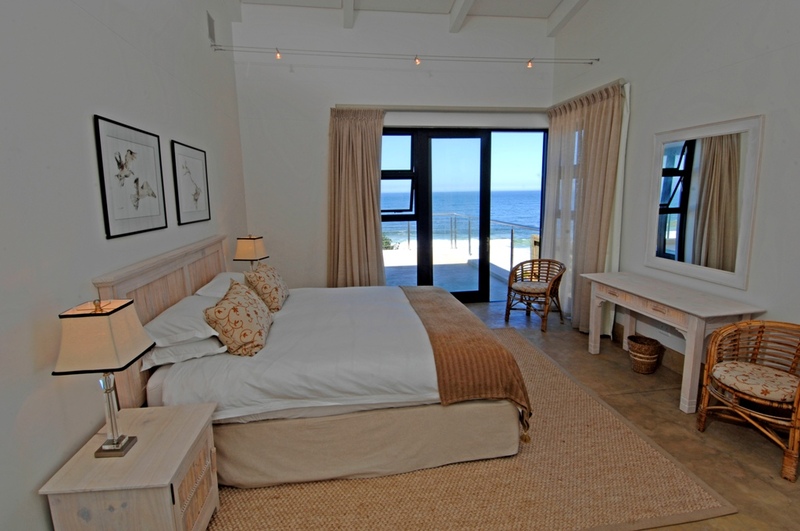 • Bed Linen (good quality cottons & down duvets), bath and beach/swimming towels are provided as well as hairdryers. • WiFI – uncapped upstairs and downstairs. Signal is not very strong in some of the downstairs bedrooms away from the signal box. 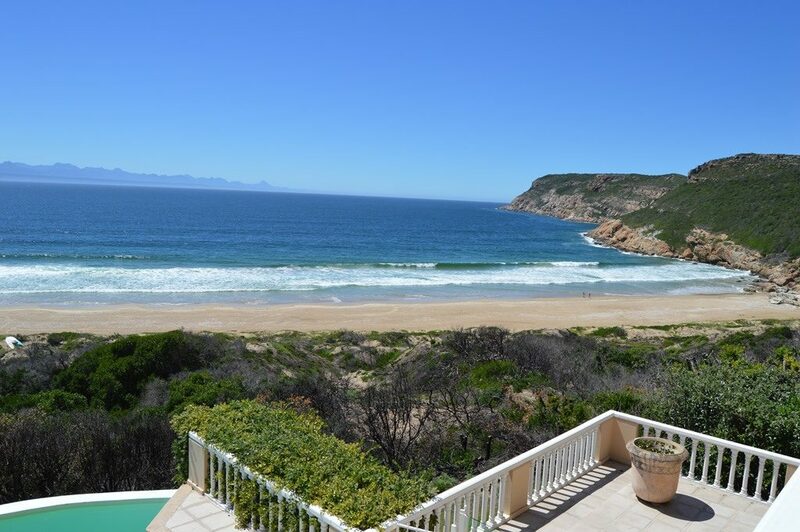 •Beach umbrella, beach chairs as well as boogie boards & board games are available for your holiday. •Outside shower for rinse-offs from the beach. •PVR DSTV decoder including smart card available & included in rental. 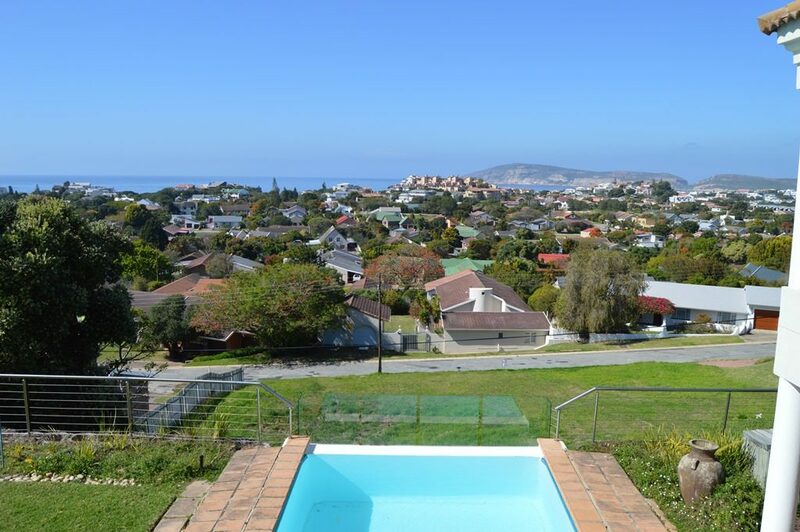 •Kitchen equipped with dishwasher, double door fridge & freezer combo and microwave. Ice-machine and Nespresso machine. Please bring your own original Nespresso pods as these are not available to buy in Plett. You can order directly from Nespresso online and request delivery to 15 Gris Nez Avenue for my attention. •Free standing SMEG oven & electric hob. •Laundry is equipped with washing machine & tumble drier. •Weber braai & portable available. •Parking for 3 vehicles at entrance behind motorized gate and fence, uncovered. 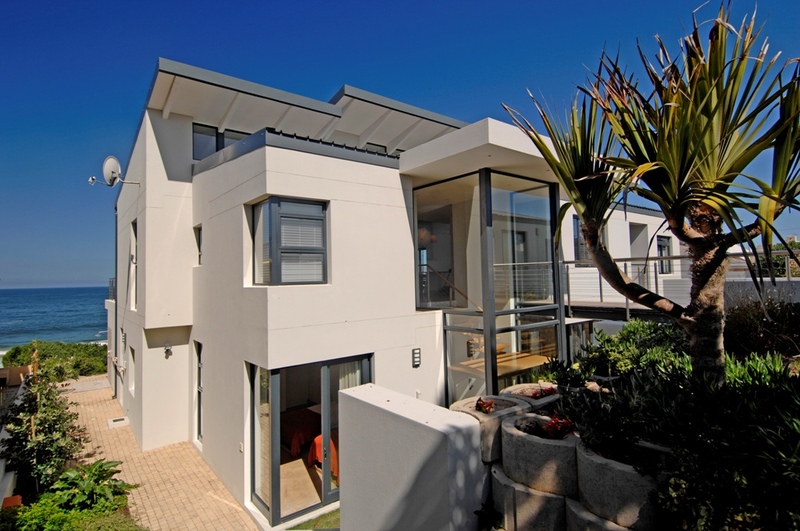 •Due to the high retaining walls and balconies, this home is not suitable for babies or toddlers. Care must be taken for children under 7. 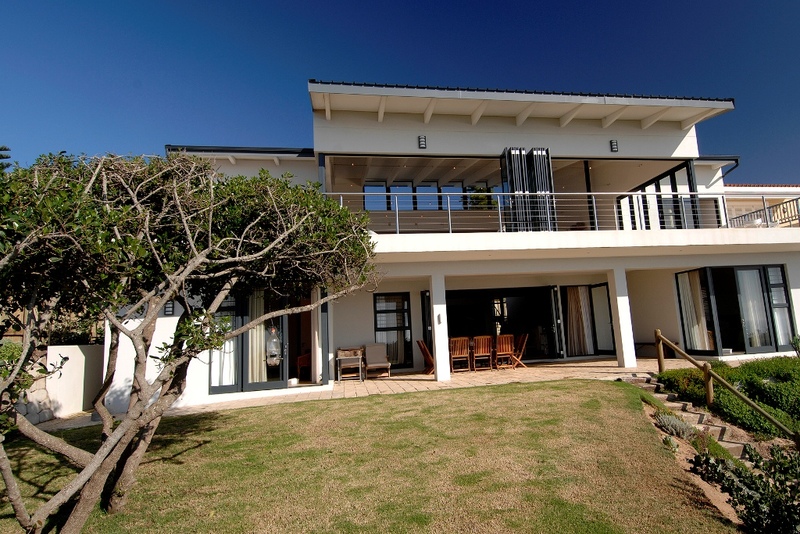 •The house has an alarm system with internal and external security beams. The property is enclosed from the street with fencing and a motorized gate. •Please note: There is a room completely independent from the house which is the owner’s storeroom and is not available or included in the rental. 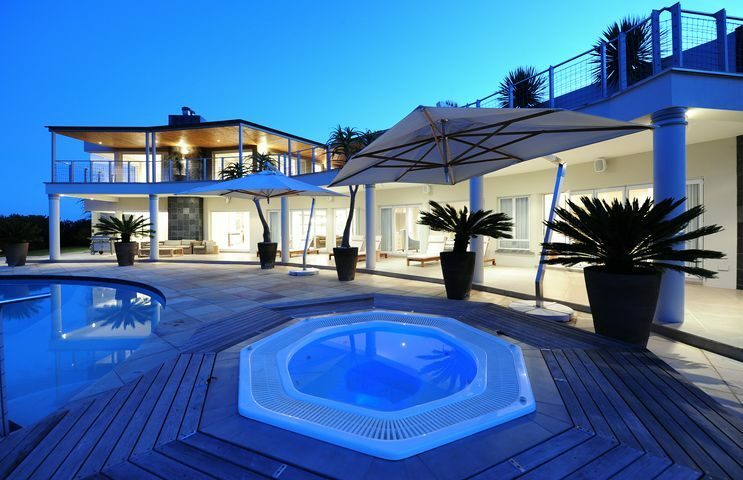 – the underfloor heating has been disconnected from the house and is not included in any reservations.